I wrote this collection because I thought there should be more small desktop toys available: little games you can pop up in a window and play for two or three minutes while you take a break from whatever else you were doing. And I was also annoyed that every time I found a good game on (say) Unix, it wasn't available the next time I was sitting at a Windows machine, or vice versa; so I arranged that everything in my personal puzzle collection will happily run on both those platforms and more. 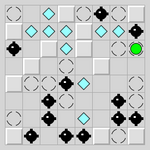 When I find (or perhaps invent) further puzzle games that I like, they'll be added to this collection and will immediately be available on both platforms. And if anyone feels like writing any other front ends for platforms I don't support (which people already have) then all the games in this framework will immediately become available on another platform as well. 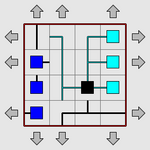 Also below each image is a link to the Windows binary for the game, and a link to the manual. For all other platforms, the games are provided in a single bundle, so scroll down to the Download section to get them all. Find the hidden balls in the box by bouncing laser beams off them. Connect all the islands with a network of bridges. 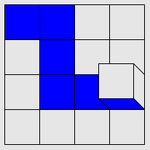 Pick up all the blue squares by rolling the cube over them. 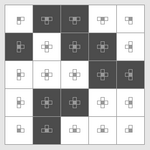 Tile the rectangle with a full set of dominoes. Slide the tiles around to arrange them into order. 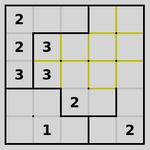 Mark every square with the area of its containing region. Flip groups of squares to light them all up at once. 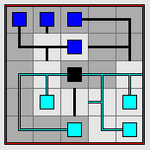 Turn the grid the same colour in as few flood fills as possible. 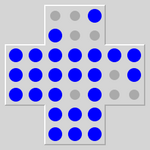 Divide the grid into rotationally symmetric regions each centred on a dot. Guess the hidden combination of colours. Collect all the gems without running into any of the mines. 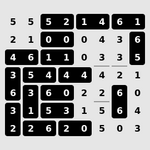 Complete the latin square in accordance with the arithmetic clues. Place bulbs to light up all the squares. 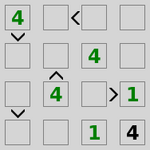 Draw a single closed loop, given clues about number of adjacent edges. Place magnets to satisfy the clues and avoid like poles touching. 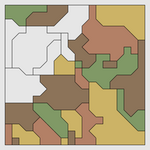 Colour the map so that adjacent regions are never the same colour. 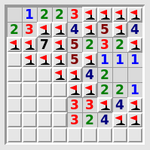 Find all the mines without treading on any of them. 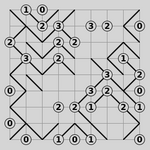 Rotate each tile to reassemble the network. Slide a row at a time to reassemble the network. 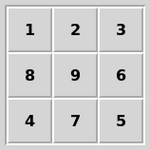 Divide the grid into equal-sized areas in accordance with the clues. 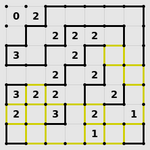 Fill in the pattern in the grid, given only the lengths of runs of black squares. 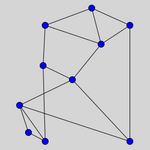 Draw a single closed loop, given clues about corner and straight squares. Jump pegs over each other to remove all but one. 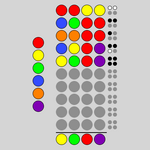 Place black squares to limit the visible distance from each numbered cell. 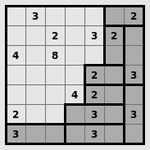 Divide the grid into rectangles with areas equal to the numbers. 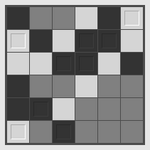 Clear the grid by removing touching groups of the same colour squares. 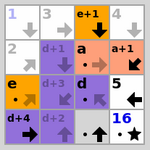 Connect the squares into a path following the arrows. Black out the right set of duplicate numbers. 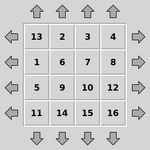 Slide a row at a time to arrange the tiles into order. 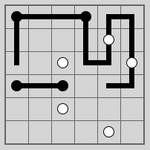 Draw a maze of slanting lines that matches the clues. 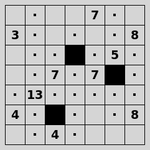 Fill in the grid so that each row, column and square block contains one of every digit. 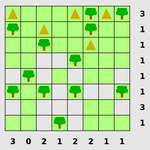 Place a tent next to each tree. 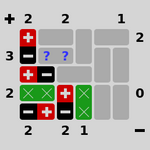 Complete the latin square of towers in accordance with the clues. 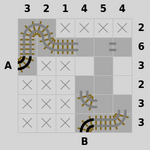 Fill in the railway track according to the clues. 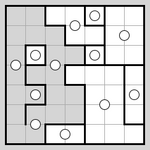 Rotate the tiles around themselves to arrange them into order. Place ghosts, vampires and zombies so that the right numbers of them can be seen in mirrors. 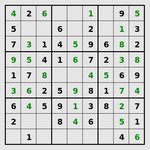 Complete the latin square in accordance with the > signs. 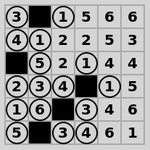 Fill in the black and white grid to avoid runs of three. 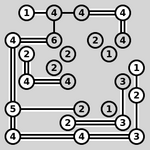 Reposition the points so that the lines do not cross. 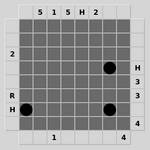 This game collection is copyright 2004-2012 Simon Tatham (portions copyright Richard Boulton, James Harvey, Mike Pinna, Jonas Kölker, Dariusz Olszewski, Michael Schierl, Lambros Lambrou, Bernd Schmidt, Steffen Bauer, Lennard Sprong and Rogier Goossens). It is all distributed under the MIT licence. This means that you can do pretty much anything you like with the game binaries or the code, except pretending you wrote them yourself, or suing me if anything goes wrong. Here is a Windows help file. If you install this in the same directory as the executable files, then each game should display a "Help" menu giving help about the game collection in general and that game in particular. You can also browse the same documentation online in HTML format. Here is a .zip file containing all of the above Windows binaries and the help file. Here is a Windows MSI installer. 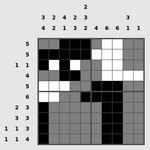 Here is a Mac OS X disk image file, containing a single monolithic application called "Puzzles". 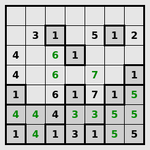 You should be able to download and open the disk image, then drag the Puzzles application to wherever you feel like keeping it; it should be entirely self-contained. Port to the Palm, by James Harvey. Port to Google Android, by Chris Boyle. Port to Symbian S60, by Tiago Donizio. Port to iPhone and iPad, by Greg Hewgill. 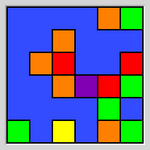 Port to Windows Store, by Lennard Sprong. Port to Rockbox, by Franklin Wei. 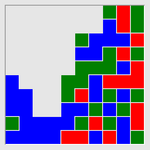 All of these puzzles are written in C, with a porting interface so that the same back-end puzzle code can talk to wildly different graphical front ends. 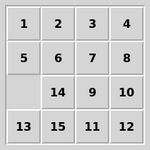 The source archive above includes native GUI front ends for Windows and Mac OS X, an X front end using the GTK+ library, and a mixed C/Java front end for compiling the puzzles into Java applets using NestedVM. 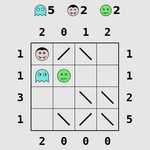 There is extensive developer documentation describing the cross-platform interfaces. If you want to write a new puzzle or a new front end (to make all these games run on another platform), this is probably the place to start. 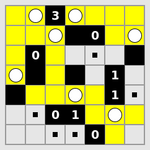 If your bug report involves a particular puzzle being faulty (if you think it has no solution, or more than one solution), please send a saved game file if possible, using the ‘Game > Save’ menu option, or equivalent. Saved game files are much more useful (and smaller) than graphical screenshots: they contain all the information I need to reproduce the game generation and find out what went wrong. Also, you might find it helpful to read this article before reporting a bug.